When deciding where to place your newly acquired gun safe, many considerations should be taken into account. Whether hunting, familial protection or a passion for firearm collection has thrust you into the world of gun safe ownership, the placement of said safe is an important task. Gun responsibility shouldn’t be taken lightly. After all, once settled, your 600 pound gun safe won’t be easy to move again if you so happen to change your mind. Placing your gun safe in the perfect spot the first time is always ideal. First and foremost, it’s important to think about the conditions in which you’d want to place your gun safe. Climate control, for starters, is an issue that many gun owners consider when placing their new gun vault. Firearms, when not placed in a controlled environment, can become damaged so keeping your gun safe in the right conditions is vital. In addition, your home’s security system might play a role in the placement of your gun safe. If you’re paying a monthly fee to have your home protected by a security system, be sure to place the safe in a part of the home that’s protected by the alarm. You’ll also want to consider the visibility of your gun safe. Many of America’s gun owners desire that their firearm storage units be concealed. As a final point of consideration, you may want to place your gun safe as far from an exterior wall as possible to avoid theft. 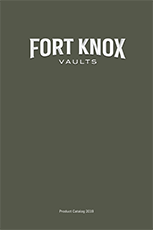 Regardless of where you ultimately decide to place your gun safe, we at Fort Knox ensure that you that both you and your family will have taken a vital step forward in the protection of what’s most worth protecting from any potential danger.